Get your Plantar Fascial Groove on with our Bow-Stringing Plantar Fascial Band. This orthotic is more controlling than an accommodative device, but the rigidity and the heel cup depth help to control, support and alleviate the symptoms of Plantar Fasciitis. 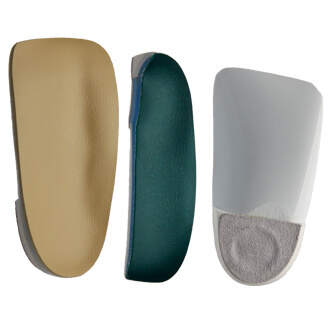 Typically, these orthotics are made from a Polypropylene or Co-Poly shell with a deep heel cup, appropriately selected for the patient’s weight, age, activity level, foot rigidity and foot shape. For additional cushion, we suggest adding a hole in the heel. This option is located on our prescription order form in the Accommodations section or write H in the Catalog Choice portion of the prescription order form. Add a Plantar Fascial Groove for a bow-stringing Plantar Fascial Band. This too is found on our prescription order form in the Accommodations section or write G in the Catalog Choice portion of our prescription order form. Note: We also offer an accommodative orthotic solution for this pathology.